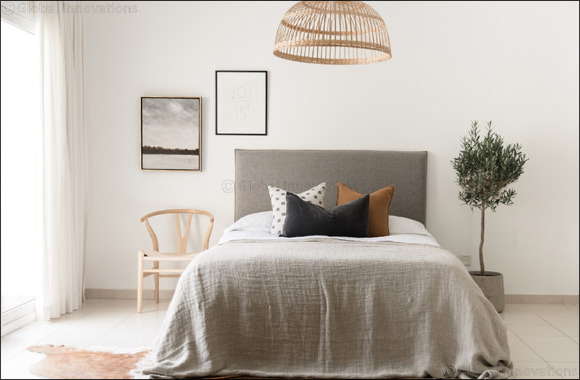 Dubai, UAE, April 07, 2019: Helmii, the UAE's first online, customised furniture store, has partnered with interior designer Kathryn Hawkes, founder of HOUSE of HAWKES, for their first-ever collaboration. Together they have designed and manufactured a stylish new bed with removable covers for the entire frame. Whilst this is not uncommon for sofas, this is a first for beds in the region, offering versatility over the traditional upholstered headboard. It is practical – easy to remove, with washable and dry-cleanable cover options – and also on-trend in its contemporary simplicity; a different cover and a few colour-schemed accessories and you have a new room in no time. You can change colours between seasons, between guests, or whenever you like as it only takes a minute! The launch collection is in a ‘limited edition' range of colours. The soft, washable, textured linen and cotton blend covers are available in off-white, beige, grey and dark grey whilst the polycotton dry-clean-only covers are available in cream, parchment, stone, grey, turquoise and sorbet pink. The mutual objective was to create something cosy and inviting that would carry HOUSE of HAWKES' signature crisp and simple aesthetic combining their creativity and helmii's manufacturing knowledge and experience.